Danny Daly joined the Brisbane Lions’ coaching staff at the end of 2014. He got his start as an Opposition Analyst with Collingwood in the early 2000s, before shifting to North Melbourne where he performed a variety of coaching roles throughout his six-year tenure at Arden Street. Daly was held in such esteem at the Kangaroos, that he was selected as one of Mark Williams’ ‘Dream Team’ Assistant Coaches in the AFL’s Hall of Fame Exhibition Match at the MCG in 2008. He moved to Richmond in 2010 and spent a further five years at Punt Road under Damian Hardwick. 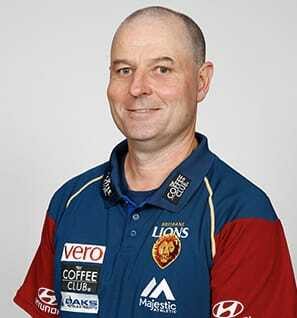 His experience was sought out by the Lions at the conclusion of the 2014 season, and once Richmond’s campaign had ended, he promptly headed to Brisbane as the Club’s Stoppage Strategy Coach. At the end of the 2016 season, under new Senior Coach Chris Fagan, Daly took on the new role of Football Strategy Coach.